Over the next while Koinup will be helping you find your way around the huge area that is Burning Life 2009. We, Poid, Fiona and I will be pointing out some of the artists who's work we like. Some are famous, some less so, but we hope to give you a few "pointers"; some interviews, some pictures, some reviews and background info. The first one I have been to see is "Bringing Water to the Desert" it's a joint build by Alizarin Goldflake and Rezago Kokorin. 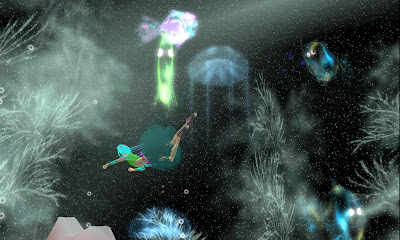 Alizarin Goldflake has been creating immersive art in Second Life since 2006. She specializes in hand-drawn textures (Corel Painter) and the creation of builds with strong moods. She shows widely in SL, including Angelgate, Ars Simulacra, the UTSA Imagine Festival, and the Crescent Museum. Rezago Kokorin is an accomplished Second Life builder and a founding member of the Virtual Artist Alliance. Before his recent sabbatical from SL, he ran the weekly Haiku Speed Build and an extensive series of classes on script modification. Many of SL's best artists got jumpstarted by Rezago. He also, along with Sunn Thunders, created the popular and informative build called "The Abyss." Like all of Alizarin's builds you get inside the piece and feel you are there, underwater in this case, and the outside just fades away. Relaxing, amusing and well made, this one is well worth a visit, and both the builders are very pleasant people to chat to.